Love Mushrooms? 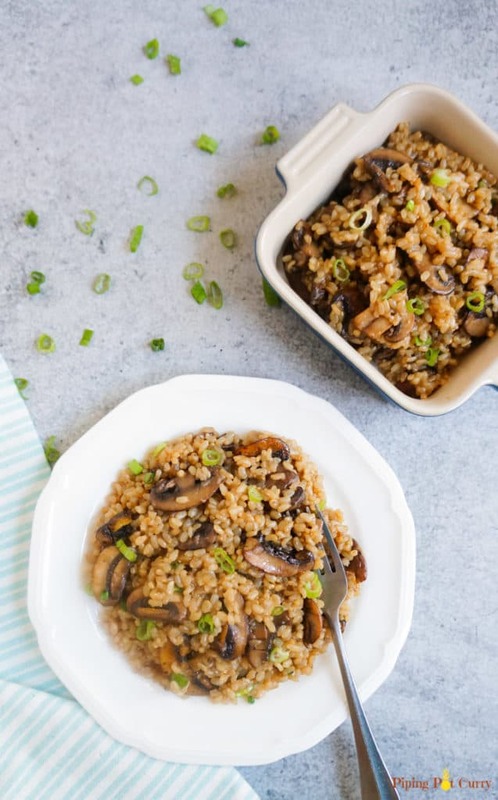 This is going to be your new favorite – Easy & Delicious Brown Rice and Mushroom Pilaf. A flavorful one-pot dish with just 5 main ingredients. It is perfect to make on a weeknight and enjoy as a side or even as a whole meal. Even better, make it on the stovetop or in the Instant Pot. 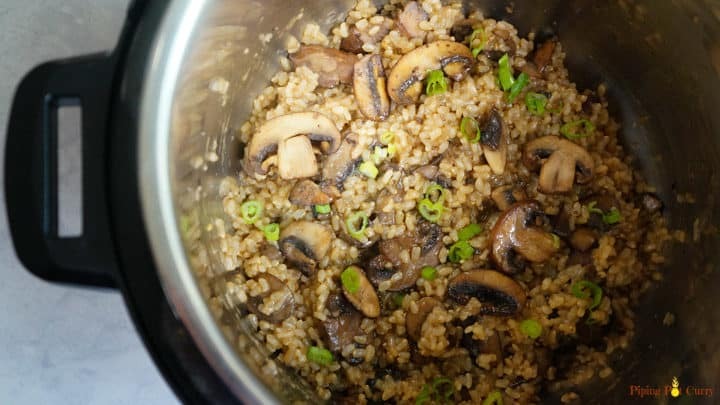 Brown Rice cooked with onions, garlic and lots of mushrooms. Topped with green onions…oh so delicious! This is also a vegan and gluten free dish. How do you feel about food being wasted just because it’s not perfect enough for the grocery chains? Oh…I can’t bear the thought of food being wasted, that too for cosmetic reasons! So I have been using Imperfect Produce for more than a year. They are an incredible service, where they source all the “ugly, but as delicious and nutritious” produce straight from farms and deliver it to your door. Okay, they also had me at delivery too…rather than having to go to a grocery store each week. Great for farmers, great for customers, and great for the environment! I subscribe to their weekly delivery. It is super easy, they send an email and give an opportunity to customize what I want in my box for the week. You can also keep your box a surprise and try new things. 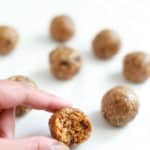 It is easy to skip if you are traveling or don’t need grocery for a week. 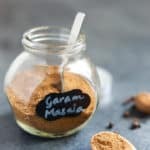 Give it a try, I am sure you will love it! This week my box included Brown Rice. This rice is imperfect as a few grains out of hundred’s are broken (I know you are rolling your eyes like me 🙄…don’t a few grains break anyways while cooking?). 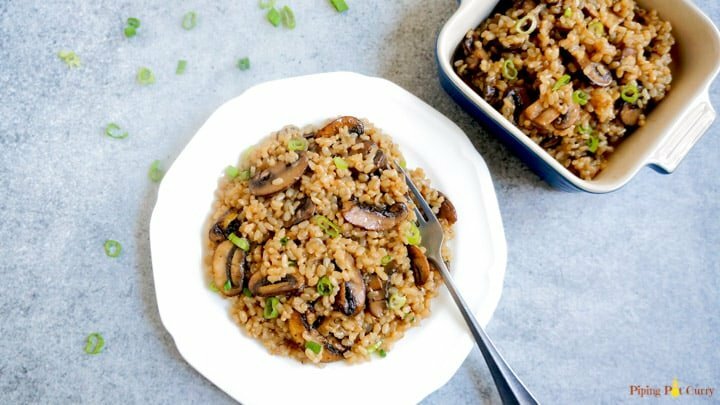 Let me show you how perfect this imperfect rice cooks, with this Mushroom Pilaf recipe. 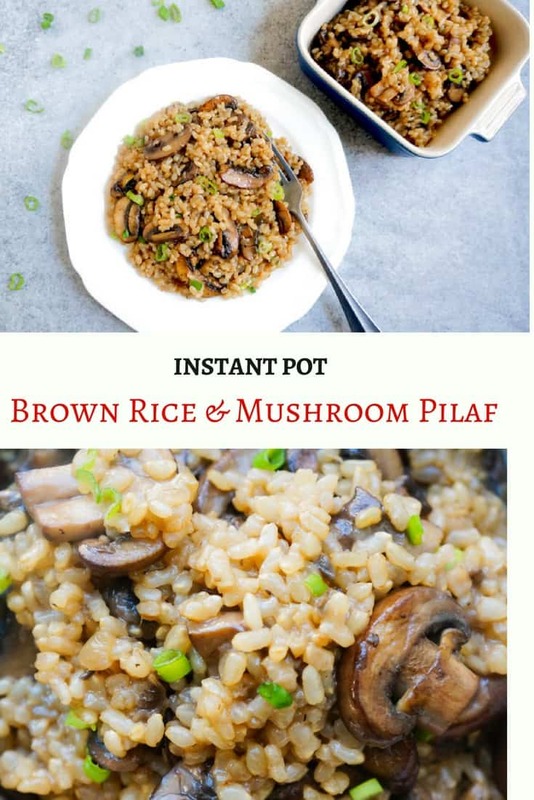 How to make Brown Rice & Mushroom Pilaf? Gather the ingredients, slice the mushrooms and dice the onions. I used cremini mushrooms, but other varieties of mushroom would work too. 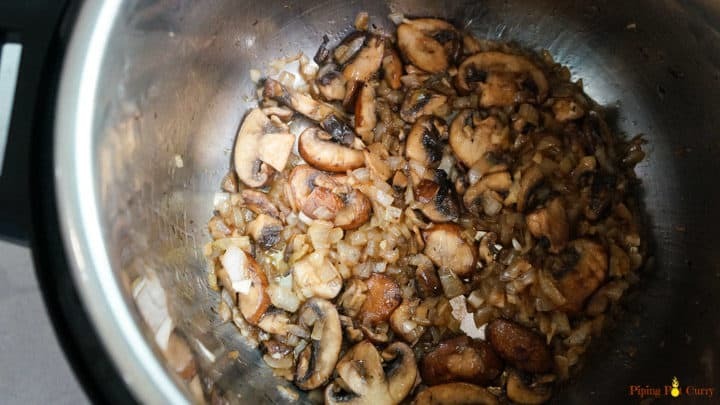 We will sauté half of the mushrooms and take them out to top on the pilaf at the end. This gives a crunchy taste of the mushrooms. Of course, you could also simply cook them all with the rice. But I like the sautéed crunchy mushrooms on the rice when serving. We will then add some oil, and sauté onions, garlic along with the rest of the mushrooms. The mushrooms will first release water, let the liquid dry and brown the mushrooms. Then add in the rice and broth. I like to cook the mushrooms with the rice, so the rice can soak in the amazing flavors of the mushrooms. When cooking this pilaf, I don’t soak the brown rice. Just rinse them until the water runs clear. However if you prefer you can soak the rice in warm water for an hour. It helps to reduce the cooking time for brown rice. This was so good, each grain separate and perfectly cooked. We enjoyed it as our lunch and two of us finished it all. I like to sprinkle some lemon juice to get a slight tangy taste to the pilaf. 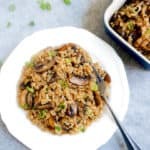 Easy & Delicious Brown Rice and Mushroom Pilaf. A flavorful one-pot dish with just 5 main ingredients. It is perfect to make on a weeknight and enjoy as a side or even as a whole meal. Rinse brown rice and keep them ready for cooking. Start the instant pot in Sauté mode and let it heat. Add 1 tbsp olive oil, half the mushrooms and sprinkle some salt. Cook them for about 4 minutes until they brown. Take out and keep them aside. We will add these in at the end. Now add 1 tbsp olive oil, garlic and onions to the instant pot. Sauté for 2 mins. Add mushrooms and sauté for another 3-4 minutes until they brown. Add back in the mushrooms kept aside. Add in the optional tbsp of butter and mix well. Top with green onions and enjoy! Heat oil in a medium-large pot over high heat. Add 1 tbsp olive oil, half the mushrooms and sprinkle some salt. Cook them for about 4 minutes until they brown. Take out and keep them aside. We will add these in at the end. When rice is done, add back in the mushrooms kept aside. Add in the optional tbsp of butter and mix well. Top with green onions and enjoy! I used cremini mushrooms, but regular white button mushrooms will work too. I made this pilaf with short grain imperfect brown rice. Long grain brown rice will work too. White basmati or jasmine rice will also work, however reduce the cooking time depending on the rice you choose. I cook white rice for 4 minutes at high pressure with 10 minute natural pressure release in the instant pot. I have used Better Than Bullion base to make broth. It is just easier to keep at hand for all my cooking. You may want to skip adding salt if using it. I like to sprinkle some lime juice just before enjoying mushroom pilaf in the bowl. 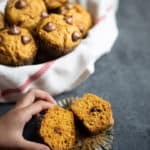 My husband and I have been meal planning with this recipe for a few weeks now, and we’re still not tired of it! Absolutely delicious. Thanks for sharing! Hey Moriah – So glad to hear you are enjoying the pilaf. Thank you for sharing back your review! Thanks for a great recipe! I found it while looking for a way to use my Imperfect rice, so I knew I had to make this recipe after reading your story. I made it on the stove and used butter and chicken broth, in place of oil and veggie broth. Hey Jill – So glad to hear you enjoyed the Pilaf. Thank you for sharing the modifications you made. I followed this recipe exacty. It burnt in my instant pot. I had to throw it away. Hello – Sorry to hear. Trying to figure out the issue – What brown rice did you use? I wonder if the type of brown rice used was different. Was the instant pot sealing ring properly in place? As if the sealing ring is not properly installed, steam can escape causing the food to burn and stick to the bottom. I hope to help figure out the issue. Thanks! Do you think this recipe could be cooked in advance by a day? 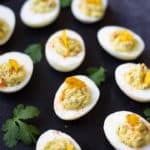 I’ve got a lot of cooking to do for Rosh Hashanah and would love to add this to my menu. Hey Deb – Yes, you can cook this a day in advance and it will be fine. Just heat it in the microwave (maybe covered with a wet kitchen towel paper) so it stays moist when you serve. Hope you enjoy it! If I double or triple the recipe how much do I increase the pressure cooking time in the Instant Pot? 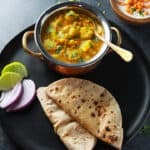 Hey Anushka – The pressure cooking time will remain the same even if you double the recipe. Hope you enjoy it! 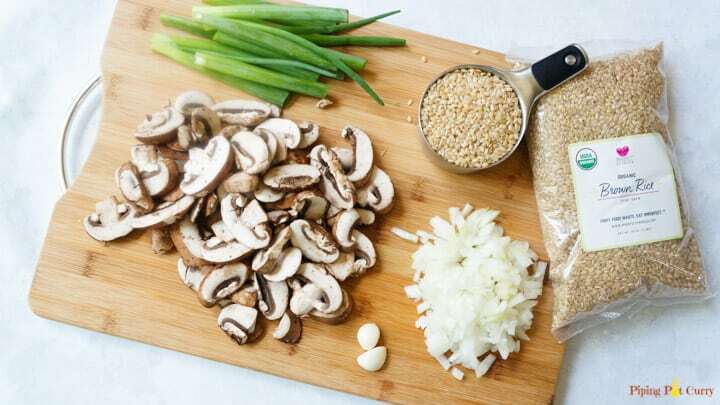 Do you add the first batch of cooked mushrooms after the rice has cooked? It looks good, btw. Hey Laura – Yes, I mix them back in after pressure cooking. I have updated the recipe card. Thank you and hope you enjoy it!